How can I create an affordable misting station? 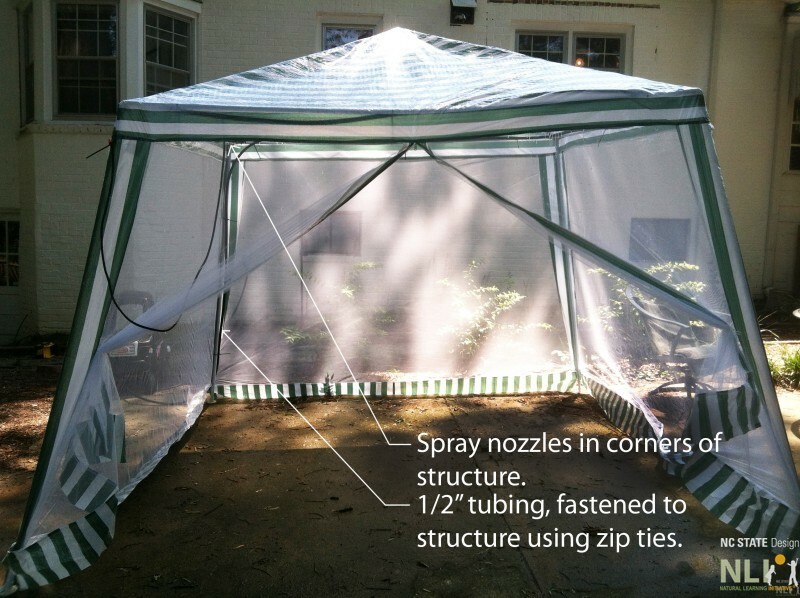 To beat the summer temperatures and transform nearly any overhead structure into a misting station all you need is about $30, a water spigot, and a little time to hook up the system. Setting up the system is simple and should only take a few hours to purchase materials and install. If help identifying parts is needed, ask someone at the hardware store for help, most stores have employees ready to answer questions. One “cap” piece for the end of the 1/2″ irrigation tubing. Choose an existing overhead structure. This could be an arbor, pergola, a tree, play structure, fence, or any convenient overhead element. Purchase of any prefabricated, low cost structure could work, too, as long zip ties can be attache (Figure 4). 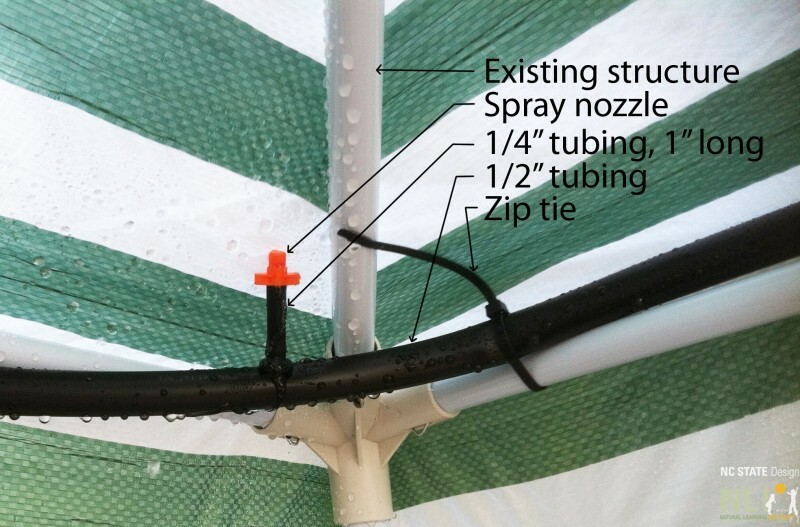 Attach the 1/2″ irrigation line to the structure using zip ties. Be sure to cap the end of the line (Figures 2&3). Use the puncture tool to poke holes where you want the spray nozzles. Corners are best. Each nozzle will cover an area of around 6′, depending on the height and water pressure. Insert couplings into each hole. 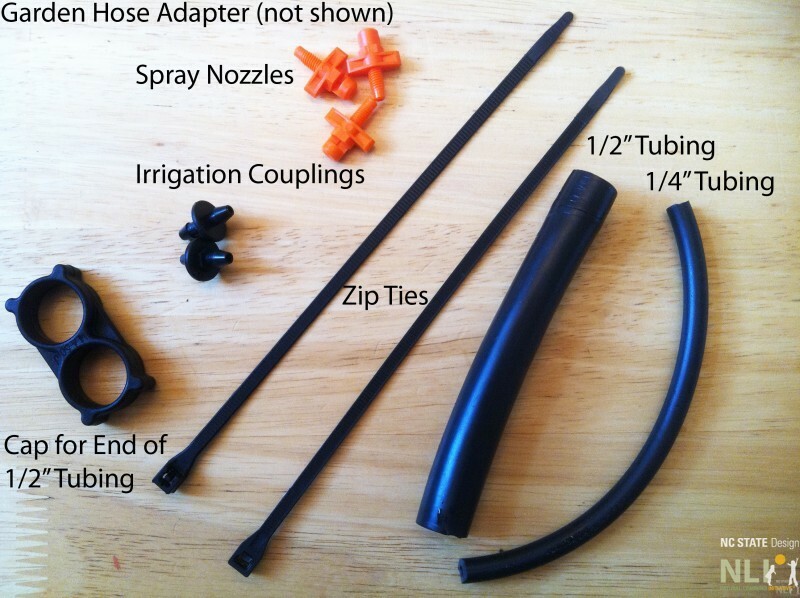 Cut 1″ long pieces of 1/4″ irrigation tubing and insert spray nozzles into each piece of tubing (Figure 3). Attach 1″ tubing with spray nozzles from step 5 onto each coupling that was installed in step 4 (Figure 3). 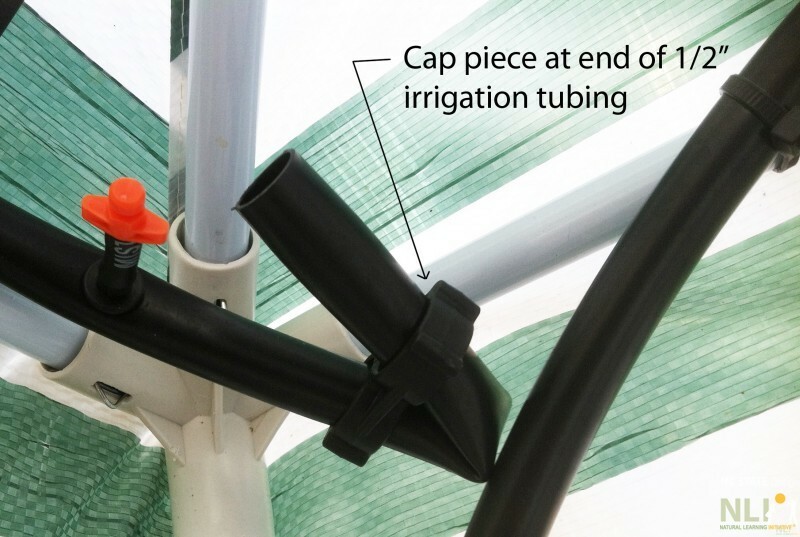 Attach hose to irrigation tubing adapter to the end of the 1/2″ tubing and connect to the spigot. Turn the spigot on and jump in! Your misting station is complete. The area under the misting station will eventually become saturated with water. Pick a location that is either over a pathway or patio or well-established turf, in order to keep the mud down, or install a piece of soft outdoor carpet. Spray nozzles can be attached anywhere on the line, so have fun and be creative! Plants can be irrigated at the same time as kids get irrigated by choosing a structure that has nearby plantings. For additional ideas to overcome hot summer temperatures, see Summer Play: Beat the Heat. 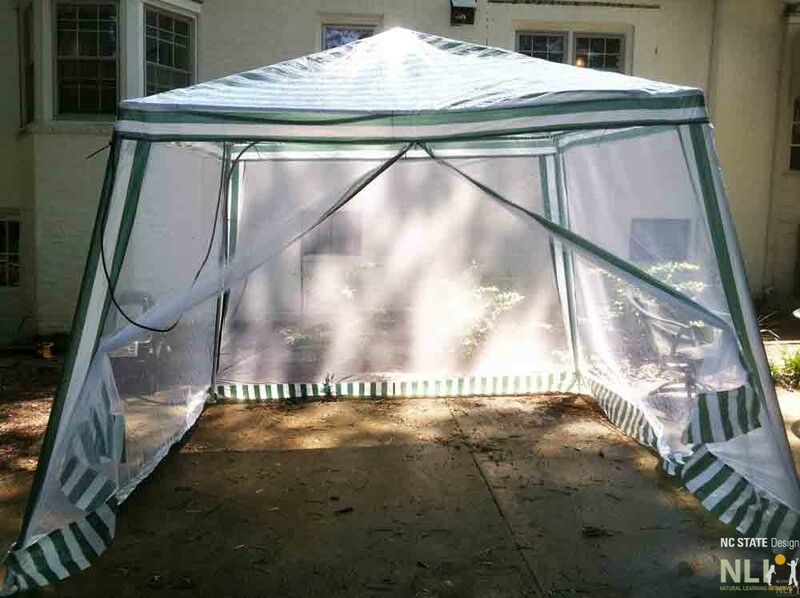 This simple tent and mist station supplies were purchased for $60.